St. Patrick’s Day, celebrated every March 17th, is a holiday that honors the heritage and culture of the Irish. This holiday was originally a religious feast day for St. Patrick, a patron saint of Ireland and a Christian missionary. However, it has since grown into a global celebration of Irish culture, with festivities especially in the UK, America, Canada, and Australia. There are many traditions that come with this holiday that people participate in every year. The most wide-known tradition is wearing green, which has a surprising backstory. It is tied to very old folk tales that say wearing green makes you invisible to leprechauns, who like to pinch anyone they can see. Which is why a lot of people pinch you when you are not wearing the color. Some people also think wearing the color will bring good luck that day, and others wear it to honor their Irish ancestry. Other traditions include special meals that are made, and most cities hold a St. Patrick’s Day parade. Shepherd's Pie is a well-known dish made with beef and vegetables and topped with mashed potatoes. There is also Irish boxty, a potato pancake, and Dublin coddle, a mixture of potatoes, onions, and sausage topped with bacon. Surprisingly, the first ever St. Patrick’s Day parade did not take place in Ireland. It truly started in the U.S. in New York, where a parade is held every year on Fifth Avenue, which has live bands, leprechauns, and dancers waving U.S. and Irish flags all through the streets. In Chicago, Illinois, thousands of people gather annually to see the Chicago River dyed green for the occasion. In our own city there are also fun things to do on this holiday. For example, there is the Green Dress Run to benefit the Child Advocacy of Mobile and the 64th annual St. Patrick's Day Parade where the Friendly Sons of St. Patrick present their parade through downtown Mobile following Mass at the Cathedral-Basilica of the Immaculate Conception. Let the shenanigans begin! 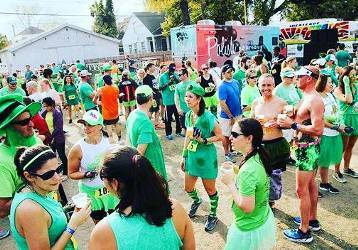 Pictured above is the Green Dress Run held in Mobile on St. Patrick's Day.